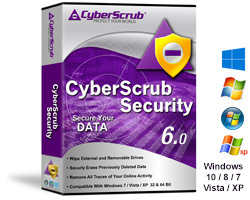 CyberScrub started in 1999 as the leader in data security, privacy and data sanitization. We provide cost effective solutions for the complete erasure of data that is available to all consumers, industry and government clients, while playing a key fundamental role within user privacy and data security. Think of us as the data cleaners that use US military grade technology to securely delete and protect your legacy data before the bad guys find it! 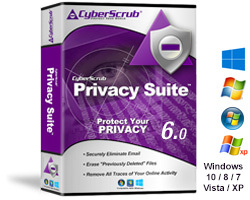 CyberScrub Security with Media Wiper and 1 yr. subscription, Protects your privacy, it helps to keep your machine clean of traces from Browsers, Windows, Peer-to-Peer, Application traces, Custom sensitive areas, etc. Privacy Suite erases your online evidence of your browsing, it securely deletes various supported applications, Browsers, Windows Sensitive Areas, Peer to Peer activities. It also destroys Emails and IM’s. Little do many know every picture, video clip, chat room conversation and website address is written to the PC’s hard drive. Whether the data is sent to the recycling bin or re-formatted, that data remains 100% recoverable leaving users in a high risk category. There is an increasingly high rate of personal information being stolen not only from companies but within homes too. Hackers are always looking for a new way to gain access to valuable information, the more data collected on a computer the more attention received from outsiders. Sensitive data such as passwords, financial or health records or even personal emails are all at risk. When you use Windows Operating System to delete a file, Windows simply removes the pointer to the file and marks the space of the file as free space. This deleted file can easily be recovered with free tools available in the market. Simple and free utilities can be used to recover everything a user once thought was deleted. Don’t allow discovery by a snoop, computer technician or unauthorized user and take full control of your data today. When you target a file using CyberScrub program, we securely overwrite the file, scramble file and folder data, remove the file from the Shadow Copy/ Restore points, so as to make sure that any of the file traces are securely deleted. Hence CyberScrub is the leader in secure data deletion and privacy protection. 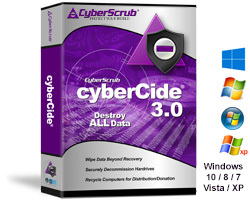 CyberScrub allows you to erase data using wipe methods that exceed standards set by the United States Department of Defense for secure file erasure (DoD 5220.22). “GOOD JOB!!! The problems were fixed in less than 5 minutes.